There is no doubt that digital content marketing is popular, but there are still plenty of questions in marketers’ minds. What’s working? Should I be outsourcing? 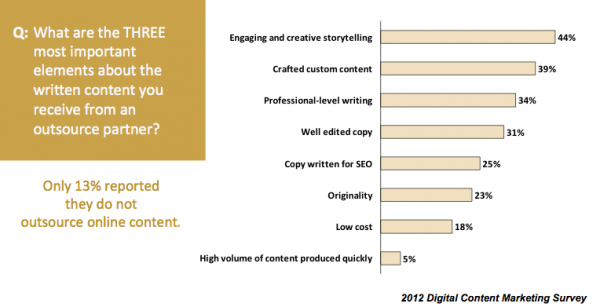 What are the most important attributes of content? 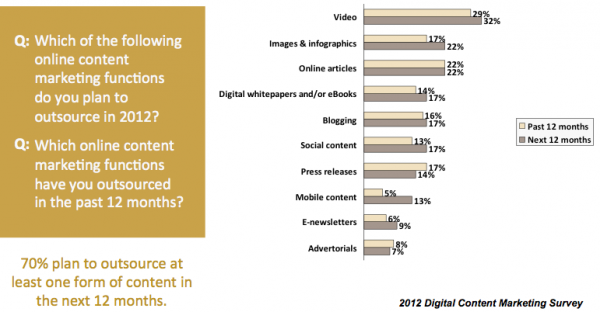 Brandpoint (a CMI benefactor) and the Content Marketing Institute set out to answer these questions in the 2012 Digital Content Marketing Survey. We queried 389 marketing decision-makers and found some interesting insights. View more PowerPoint presentations from Brandpoint. Similar to what we found in the 2012 B2B Content Marketing Benchmarks, Budgets and Trends Report, the most common types of content marketers use are social content (90 percent) and blogging (75 percent). 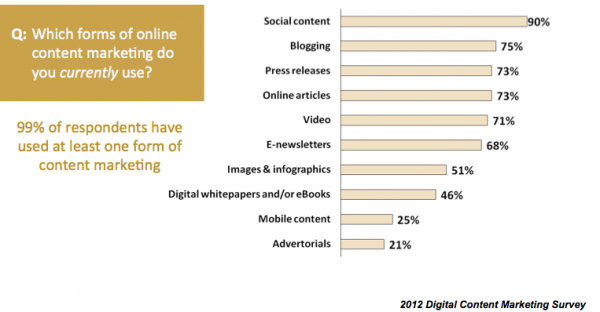 Marketers see the best results from social content, e-newsletters, and blogging. Seventy percent of marketers plan to outsource at least one form of content in the next 12 months. Video is the type of content marketers most often outsource, followed by images/infographics and online articles. Marketers consider three attributes of written content to be of the greatest importance when they use an outsourced partner to create content: engaging and creative storytelling, custom content, and professional-level writing. What are your favorite results from the survey, or what questions do you have?